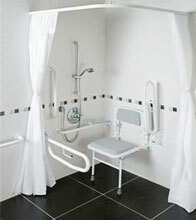 Plastic Shower Rail - Perfect for wetrooms and shower environments. - Horizontal and vertical grab rail for an assured grip. - No earth required when fitted in shower area. - Not cold to touch. - Slip resistant fluted grip.